We've seen some cool concept art of Chris Evans in his battle ready Captain America outfit, but we are all anxiously awaiting for the day we actually get to see what it's going to look like in real life. Evans recently gave an interview in which he talks about the Costume and the Shield he will be throwing around. It’s an amazing costume. Given the fact that his costume is red, white and blue, and it’s tight, and it could be kind of flash and over the top – and given the fact that the movie takes place in the ‘40s and ‘50s – they’ve done a really good job of making it look really cool. Just a little reminder that there will be two Captain America outfits, one will be a show costume and the other is a battle ready costume. The show costume will be worn when America is showing off their new war hero during the USO shows. This flashy costume will be a nod to the original design. The battle ready costume will be what he wears when he's kicking the Nazi's teeth in. I think everyone that’s going to see it is going to say, 'Okay, well done. Well done. I think they got the costume right. The casting they completely ruined, but the costume they nailed! Ha! Nice. 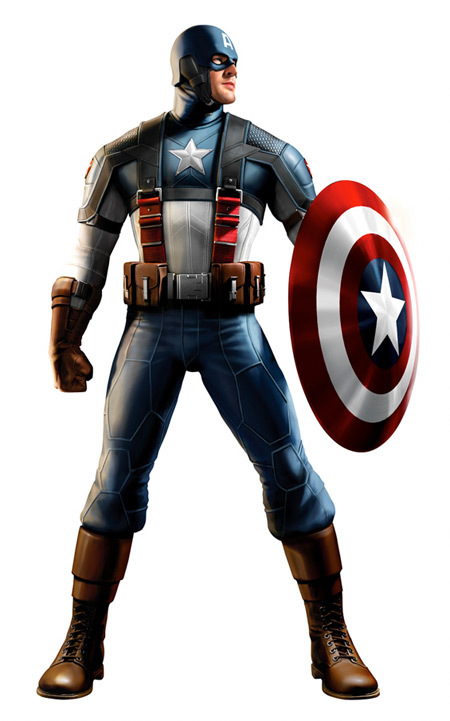 I've never had a problem with Evans playing Captain America, but there are a lot of people out there that do. I think he'll end up doing a fine job, the guy is a really good actor. In comparison to the Fantastic Four costume he had this to say. [In the FF suit] …you could move around quite well. This is a little more cumbersome. It doesn’t exactly breathe the way the Fantastic Four costume breathed, but it’s the way it should be. Any type of World War II uniform would be a little chunky, and I think that’s what kind of gives it its character. He then goes on to talk about the Caps shield. We’ve been testing a lot of shields. Last time I was in London they had six shields and I had to hold each one, see if I was comfortable with each one, see which one we all thought had the right look. The thing is pretty heavy, so I’m not sure I can throw it that far! I’ll give it my best shot, but hopefully they’ll have some sort of stunt shield when it comes to actually chucking it! I love throwing shields, it's what I do in my spare time, so if they need a stunt double to throw Caps shield around for a bit maybe someone from Marvel should give me a call. I hope we get to at least get to see some actual photos of these characters from Captain America: The First Avenger in full costume at Comic-con this year.